Day 48. Tomorrow will be two weeks since I met with Screenwriter Monica and she delivered the first draft. I have been so slammed just keeping up with my work for the documentary that I have not cracked open her script again since I read it the first time. I was hoping to give her notes this weekend. Obviously, that’s isn’t happening since I haven’t got any notes to give her yet. The new plan is to carve out some time away from scenes 12, 13 and 15 over the next 48 hours so I can begin to wrap my head around the direction I want to take the script in. Hopefully, I’m also going to meet with a producer/director friend of mine on Sunday to hear her thoughts on it. Will I get it all in? I don’t have the best track record but I will try. I know, I know, Yoda, there is no try, only do or do not. But isn’t that just semantics? If you don’t try to do something you’ll never ever actually do anything. I’m trying and doing. I’m probably trying to do too much but hopefully that will guarantee that I at least do a little something. What’s that quote about shooting for the moon but landing in the stars? Oh forget it. I have too much to try to do to look it up right now. 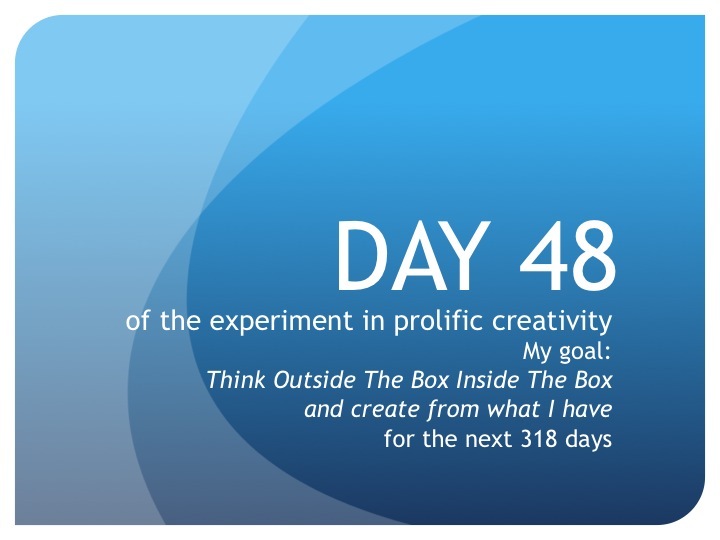 Bottom line, whether I have time to or not, I’m shooting for thinking outside the box inside the box and creating from what I have for the next 318 days! Until tomorrow, create from what you have…whether you have the time to or not.